Janitorial Service Dallas, TX | Cleaning Service - Courtesy Building Services Inc.
Do you need help with your office cleaning needs? Are you unsure what specific cleaning methods will suit your business? Does your in-house cleaning staff not quite meeting your requirements? No matter what questions you might have, we are always here to lend a helping hand. Courtesy Building Services, Inc. operates 24 hours a day, 7 days a week. You can contact us at 800-479-3853 anytime! 8:30 am-5:00 pm from Monday through Friday. 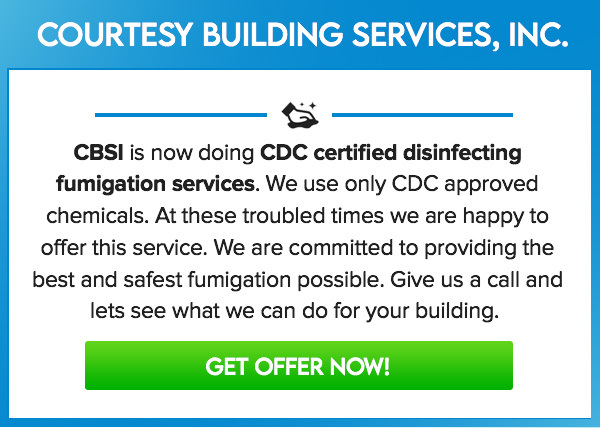 clean@courtesybldgservices.com or call us at 1-800-479- 3853 (toll-free)!